Gazpacho are never going to blow anyone away. They may sidle up beside them and whisper in their ear (sometimes that can be equally as effective, not here though), but they'll never jump out of your stereo and grab you by the balls. What you get instead is an EP that keeps you guessing, and second-guessing, the whole way through as to what's going to come next. Gazpacho you see don't just play one style of music. Oh no, that would be far too simple. Instead they play a bit of jazz, some '80s synth pop, the sort of guitar music advocated by Coldplay, the odd surprising really, really good moment and all this is topped off by a very competent singer. 'The secret' opens powerfully and has a breathy, synth-based pre-chorus that works wonders, but is let down by the throwaways, instantly forgettable verse. Thankfully, it does open out into a huge outro that brings to mind the multi-instrumental, crashing epics found on VAST's debut. The clear piano and gentle vocal melodies on 'Ghost' throw all previous Coldplay comparisons out of the window. At times, it threatens to explode into a fully blown, rock mid-section, but it eventually sinks back into the safety of the chorus and its haunting brilliance. It is, at moments like these, that you really think Gazpacho are onto something. Take 'Nemo' for example, the drums and bass, by clever interplay, appear to pull the song in two different directions, which makes the song to seem to have two distinct tempos. Oblivious to this struggle for dominance the guitar lets fly single, ringing notes. It all then comes together in a suitably, subtle rock chorus. A strange combination of Tracey Chapman and The Calling. Where 'Get it while it's cold' falls down is that the bad follows the good in droves, equally as often and definitely as strong. 'Delete home' is an exercise in pointlessness and seems to have only been put here to make 'Sun god' sound better than it actually is. The sweeping and soaring synth sounds robbed from what was probably Ultravox failed to impress in the slightest. Diverse musical input lies at the root of Gazpacho's problem. Diversity is great, but here the differences are so wide and bizarre that you're left with the impression that you've just been listening to a compilation album. The only things missing are reggae beats and bagpipes. 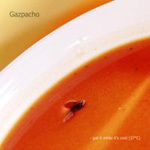 Gazpacho have the ability to pen a decent tune, but their attempt at blending every style under the sun onto one album makes this quality rather redundant.